Folks at XDA-Developers have managed to hack PlayStation 3 with Google Android phones. With this hack or let’s just refer it to as jailbreak, you’ll be able to create backups of your PS3 games. You’ll have to use Google to find other uses. You can follow the step-by-step guide posted below (at your own risk) to jailbreak your PlayStation 3 using a rooted Android phone. Redmond Pie is not to be held responsible if you end up damaging your PS3 or Android smartphone. Got that? Now let’s get it ON! Before you start though, be sure to check that your phone is compatible from here. Step 1: Download the following package, and extract it using an unzipping software like 7zip or WinRAR. Step 2: Now extract the file named “N1-CM6-PSFreedom.tar.gz” (using the aforementioned software above) and copy the contents of that to your Android phone’s microSD card. Step 3: Also copy the file named “PS3-signed.zip” and “PS3-no-more-signed.zip” to your microSD card and reboot your phone into recovery console. Step 4: Once you reboot, flash “PS3-signed.zip” on your phone and reboot it. For PS3 Slim Model: unplug console from wall. Now connect your Android phone via USB. 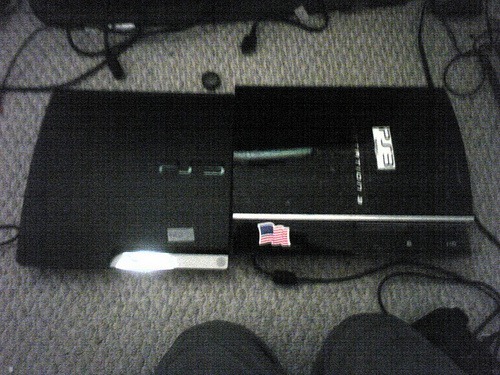 Step 7: Turn on your PS3 and press the power button followed by eject button in quick succession. Step 8: BOOM! Your Sony PlayStation 3 is now hacked with an Android phone! You should see “Install Package Files” under Game on the Cross Media Bar (PS3’s UI), this will confirm that your PS3 is now hacked. You can return your phone to its previous non-flashed state by booting back to recovery mode and flashing “PS3-no-more-signed.zip”. The hack does have a few bugs though, namely: Wi-Fi and USB Mass Storage which will be disabled on your phone until original boot image is flashed back. Also, the iPhone hacker MuscleNerd has confirmed that this hack will be coming to jailbroken iPhones soon!! Disclaimer: Hacking or modding your PlayStation 3 (PS3) might result in Sony banning your console from PSN (PlayStation Network). Use it only at your own risk.